In order for Dalit Bahujans to have a future, we must know our past and have self-determination over the knowledge we build. As we enter ‘Dalit History Month 2018’, I am struck by the violence that Dalit history brings up for the powers that be. 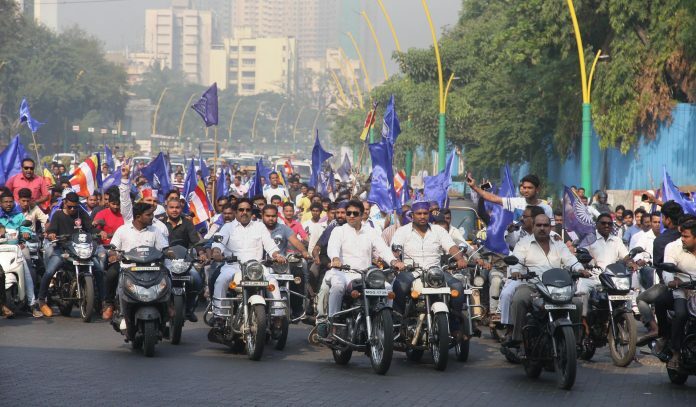 This is the year thousands of Dalits were attacked, with many still in jail, for celebrating the battle of Dalit resistance at Bhima Koregaon. It is also the year when Dalits, who have always celebrated Ambedkar Jayanti at the UN, have been removed as co-sponsors of their own event because the Indian mission feels that Dalits are not necessary in the celebration of Ambedkar, and, more importantly, that if they are involved, they will bring up the issue of “caste”. If the attacks on our celebrations weren’t disturbing enough, there is the continued destruction and desecration of the statues of our leaders, Ambedkar and Periyar. This is how threatening Dalit history is. They would erase it, destroy it, jail it. As if these actions could erase the resistance to caste apartheid. As long as Dalits are alive, our history will thrive. The very presence of Dalits and our history is a threat to all those who benefit from our exploitation. This is one of the reasons I co-founded Dalit History Month and also created Project Mukti. I believe that in order for Dalit Bahujans to have a future, we must know our past and have self-determination over the knowledge we build. Ever since I realised that the history I was taught as a child was those of my oppressors, I knew I had to unearth the history of my people, my community, and my ancestors. I am not talking of the history of a hundred or thousand people. It is the history of 25 per cent of India’s population, of 330 million people, which is equivalent to the population of the United States. Do we not merit the world’s attention when we represent five per cent of the world’s population in India alone? Dalit Bahujans are the backbone of India’s growth and development. We till the land as agricultural labourers. We lay bricks to build the country’s great infrastructure. We clean the streets and the surroundings to create a healthy environment for others. We starve our families to feed others’ children. We fight at the forefront to safeguard the country, the rulers and the landlords. Most importantly, we have led the battles to fight the inhumane caste apartheid. We break the shackles of caste slavery and continue to rise to heights beyond Brahminism, where we create our own ecosystem of liberation – through Dalit Bahujan movements, art, literature, businesses, and, of course, education. This year, inspired by the vitality of the movement for Dalit history, Project Mukti is supporting over 20 events across India to celebrate Dalit History Month. These events are meant to celebrate Ambedkar by lifting the voices of Dalit Bahujan leaders and movements all over the nation. These historical milestones, the stories of our leaders, of our movements, are the real inspiration for our movements today. 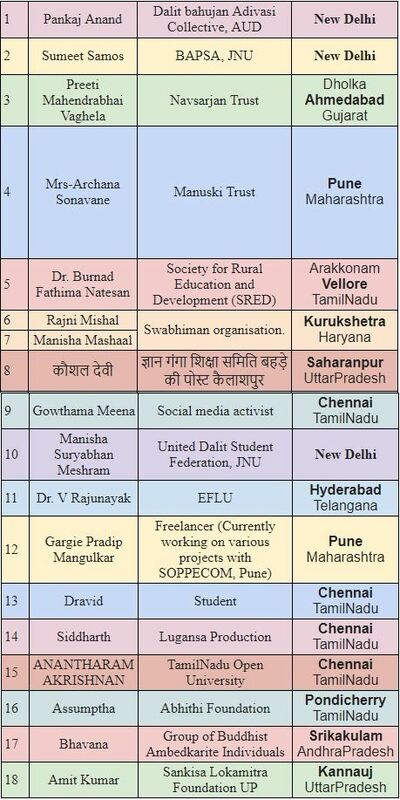 As one of the founder-members of Project Mukti – the first technology collective helping Dalit Bahujan Adivasi women, gender non-conforming and trans leaders beat the caste apartheid in south Asia – I am committed to Dalit Bahujan and Adivasi knowledge and history. It is an honour to stand with all these communities, which refuse to let the light of Dalit history go out in this difficult time. The events that we are supporting for Dalit History month include celebrations at Indian universities like English and Foreign Languages University, Jawaharlal Nehru University, Ambedkar University Delhi and Savitribai Phule Pune University. The events will be held by radical Dalit women collectives and leaders like Fatima Bernhard and Cynthia Stephen, and Buddhist organisations like Manuski trust. You can read the full list of events below. Dalit History Month as a whole is growing all around the world, with new events in Germany, the UK, and the US. We know that our history shapes our present and future, and now, more than ever, we cannot risk staying silent. We must continue to celebrate our leaders, revolutionaries, historical moments, movements, places, our art and culture. These are our oral histories that have been passed on to us by our great, great ancestors, who may not be great historians by profession, but are great historians by heart. Dalit history is here to stay and we are not going anywhere. Dalit history is not only the key to Dalit Bahujan futures, it is, in fact, the only key for the future of India. Jai Bhim, Jai Savitri, Jai Fatima, and Jai Birsa! Sanghapali Aruna is the executive director of Project Mukti and a co-founder of Dalit History Month. On reading this, one is reminded of Robert Frost’s words (made famous by Nehruji): “I have miles to go before I sleep, I have miles to go before I sleep.” There is so much to be done by all of us in this space! Thanks to The Print for the focus! I find it painful, though, that some dalits and dalit sympathisers consider castigating Gandhiji as evidence of their having awakened. Really? Gandhiji did more to raise our collective consciousness against the crime of untouchability than any person in the early 20th century. Who do you blame for this situation ?? the divide and rule political parties who have tried to divide citizens of this country on basis of caste, creed, color, language and religion?? if the prior governments had given free and quality basic education to the poor and down trodden and to create level playing field and finally topped it up with reservation based on the economic criteria of citizens, this country would have progressed leaps and bounds. A very worthwhile and praiseworthy initiative. Almost seventy years after the Constitution was adopted. it should not have been necessary for Dalits to fight so desperately for their rights and a dignified place in society. The most recent outrage is of a young Dalit man being killed for owning and riding a horse.